I was searching for an attractive matte nail polish (which would be AT LEAST 3 free) until I found this gorgeous Zoya Savita Matte Velvet Nail Lacquer totally by accident. I instantly fell in love with it! For those who haven’t heard about Zoya – it’s vegan, 5-free, and cruelty-free nail polish brand with products free of toxins, like toluene, formaldehyde DBP, dibutyl phthalate, and camphor. 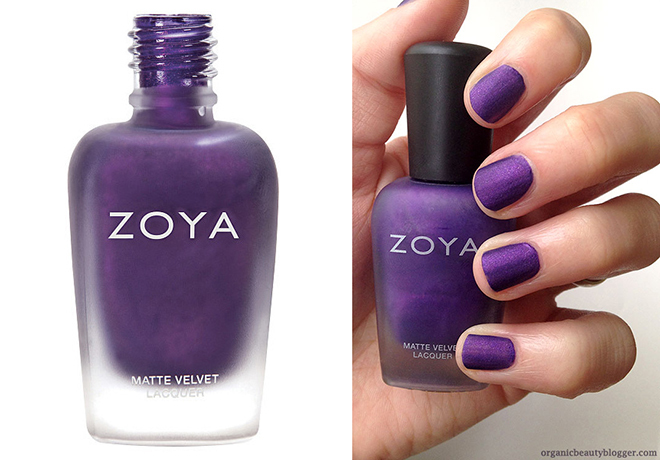 Zoya Savita Matte Velvet is amethyst purple matte shimmer nail polish. Its consistency is not too thick and not too runny (somewhere in the middle), which helps with a smooth and easy application. Zoya recommends giving 10 minutes for a formula to dry into matt, but in reality, it takes only a few minutes or so. I would say that 2 coats are required with this polish because it just looks too messy after 1 coat. I’ve tried a few other non-matte Zoya Nail Lacquers before and was very pleased with how long they’ve lasted, but Savita seems to be another story. Sad to say, but it was almost impossible to keep it on my nails for longer than a day (it starts to chip on the same day if you have any contact with water). The problem is that you can’t even use any ordinary bottom or top coat, except the one created specifically for matte polishes, because it would turn matte finish to glossy. So overall, the shade is stunning, and it’s perfect for a party or any other short event, but if you want longevity, this is not a nail polish for you. Zoya Savita Matte Nail Laquer is available online for $17/£10.50. Have you tried matte nail polish? Wow what a stunning colour! but not very practical… typical! Maybe good for a specific event and special occasions not day to day wear. I agree, it is amazing for special occasions! Wow that looks amazing! Too bad it doesn’t last. I recently bought Zoya Storm and I love it. googled Zoya Storm and it looks spectacular! How long does this one last? This is so gorgeous! Thanks for sharing. I’m a bit purple obsessed – what a great colour. Guess like a blooming flower you have to enjoy it while it lasts! Zoya doesn’t use many of the nasty toxic ingredients found in most other mainstream nail polish, which might explain it’s shorter life span. But we feel it’s a worthwhile trade off not to be exposed to hazardous fumes and skin irritants.